By “Don’t Sweat It,” I am referring to not wearing sweatpants “unless you are going to the gym” – a piece of advice given to viewers on TLC’s “What Not to Wear.” I love that show and have watched it for several years. If you have not seen the show, Stacy London and Clinton Kelly (the stylists) teach people how to dress for their body shape and size. For example, many of the guests are women who have recently had children and are still carrying extra baby weight. Stacy and Clinton will offer them tips on what style shirts and blouses to wear to help camouflage their tummies without looking baggy or frumpy. The guest is also given a new hairstyle and make up look and most of them look like completely different people with their new clothes, look and confidence. It’s very uplifting and inspiring to me. I always want to go shopping after I see the show! Now, I am not a major fashionista, but I do try to wear trends and prints that fit my body. I cannot wear all trends, as I am only a little over 5 feet tall and slightly curvy. The recent trend of wearing long shirts and skinny jeans/leggins is something I cannot do. I will look like a tree stump. As a petite woman, I am not supposed to wear anything that is lower than my crotch or it will make my legs look even shorter than they already are (thank you, Clinton). And, I have large, um, girls. When shopping for tops, I often have to shop in both misses and petites, which is something Stacy and Clinton recommend if you are bigger on top and smaller on the bottom or vice-versa. My point is, the show has taught me that dressing for your current size and shape is more important than dressing in trends. Sorry, Stacy and Clinton. I love you both and enjoy your show, but sweats are a must in my life. Now, I have to go run some errands…which pair will I wear today??? Sorry that my post is late today. My mom and I took mental health days and gave ourselves the best therapy we could think of – shopping and lunch. And then a second treatment of shopping! We were both smiling and laughing the entire time, so it was definitely successful! Shopping is something I have always enjoyed doing with my mom. She does not really partake in any of my other hobbies (she has no time), but shopping is something we have done together for as long as I can remember. And it was not until I was older when I realized that she was teaching me lifelong lessons that I still use to this day. Then, we began clothes shopping together. This is something we both love and try to do every few months. Today, we were specifically looking for work clothes for her and today, I was giving the lessons. I advised her to branch out a little in terms of colors, length of pants, fit and the new styles. My mom is still working, though she should be retired by now, and has always been pretty trendy…as long as I shopped with her. I am not sure what went wrong those few times she ventured out on her own and came home with patterns that were way too old for her. There came a point where I had to tell her to either take me shopping at all times or to not take the tags off anything she bought alone until I saw them. Thank God that was short-lived. Since I moved, she and I don’t get to get together as much as we would like to and she has been doing very well choosing great patterns, prints and colors. I like to think that my voice is in her head in the mall, much like her voice is in my head in the grocery store. Today, she hit the jackpot. She has very thin legs and we finally found pants for her at JC Penney. Yay! Our last stop was the make-up counter at Macy’s. And, yes, I bought ANOTHER Bobbi Brown eye-liner gel (this is becoming an obsession). She bought the same colored gel, eye shadow and make-up remover. These were based on my recommendations (along with the beauty consultant). We took the consultant’s card and decided that the next Mental Health Day will also involve make-overs. I love my mom very, very much. She was a mom to me growing up, not a friend and I appreciate that more and more as I get older. The memories I have of us together during our shopping trips are in a special place in my heart and my mom’s advice is always in my head, especially in the stores. I am glad we made the time to shop and spend time together today and cannot wait for our next excursion!!! One of the many things my husband and I have in common is that we truly enjoy and appreciate nature. We like to canoe, hike, snorkel, snowboard and always enjoy the beauty of a sunset, sunrise, fall foliage and the sunshine glistening off a stream. It brings us a peaceful feeling and is invigorating to us both. However, with the demands of everyday life, work, family, etc, we do not get to enjoy being outdoors nearly as much as we would like. As my husband says, we have to MAKE time for our nature outings. Put it on the calendar and just do it. Forget the other chores and things we could (should?) be doing at home. We need to be outside for minds and our hearts. This weekend, we were reminded of how important it is to be one with nature and all it has to offer. Despite the shining sun, the air was cold and there was a slight wind that stung our face, but we did not care. Somehow, the worries of everyday life blew away with that wind and when we finally took a break after three hours, our hearts were softer and our minds felt lighter. We settled into the lodge, drank some creamy hot chocolate and reflected back on our day. There was an amazing rejuvenating feeling that we had not felt in a looonnnggg time. That is going to change. I do not think any of us are ever too young or too old to enjoy the sights, sounds and smells of Mother Nature. And, most of the time, outside activities bring out the kid in all of us whether it be snow tubing, hiking or playing on the beach. I don’t want our hearts to even begin to grow hard again. I am heading to the calendar right now to schedule another day with Mother Nature and hope you’ll give it a try as well! I love pasta. Any kind and any way. It has always been a great comfort food of mine and the reason I could never be successful at a low-carb diet. I will not give it up! I’d rather have a few extra pounds on me and enjoy my macaroni rather than be really skinny and not able to eat it. That might sound sad to some, but it’s true! I have been trying to make my pasta recipes a little more healthy and wanted to share my newest one with you. I was inspired by Ree Drummond – again. (Okay, I am kind of obsessed with her at the moment). She made something she called Pantry Pasta. I have made similar dishes in the past, but this time, I think I really got it down. Hope you enjoy it! 1. Cook pasta 2-3 minutes under the recommended time. 2. In a large skillet, saute’ chopped onion in 2 TBSP olive oil for about 5 minutes. 3. Add chopped garlic and let it cook about 2 minutes. 4. Add can of tomatoes. 5. Simmer about 10 minutes. 7. Let simmer for about 15 minutes or until the sauce thickens up a bit. 8. 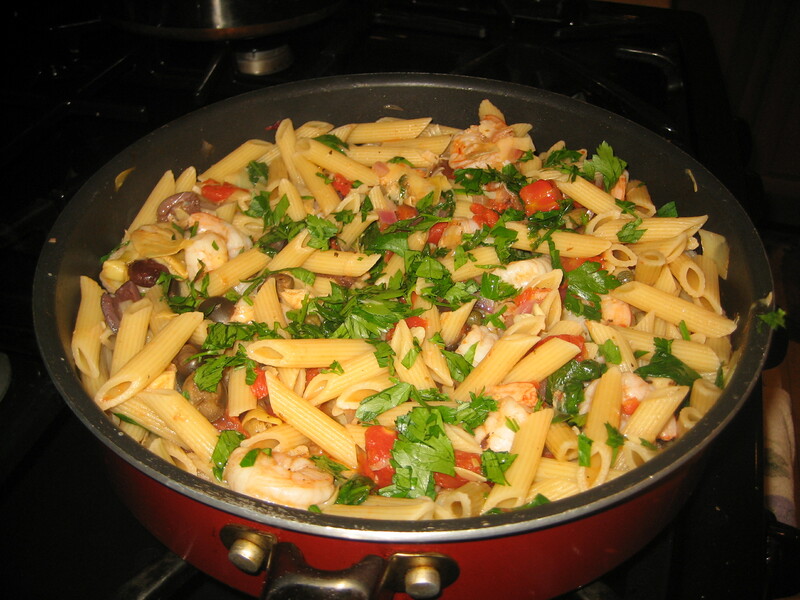 Add pasta to the skillet and let it finish cooking for 2-3 minutes. 9. Add spinach and toss. It will wilt quickly. 10. Sprinkle with feta or parmesan cheese and a little more parsley if desired. I added some shrimp to this. I just sauteed them in olive oil with a little salt and pepper and added it to the pot at the end. I like winter. I enjoy the cold air and snow, mainly when I am able to enjoy it by going snowboarding, snowtubing or on the back of a snowmobile. I do not, however, like having to bundle up just to go put the garbage out! As much as I love winter, my body does not, especially my lips and hands. When the air is cold and dry, even gloves do not seem to protect my hands. They start to get that white look to them, hurt and then begin to look like an 80 year old woman’s hands. AHHH!! Dried up hands do not go well with a nice manicure or when you like to wear rings, like I do. This is one thing I despise about winter. My poor dry hands. When I was a teacher, I would wash my hands often to try and prevent getting sick, but the high quality soap in the school bathroom really left my hands dry and cracky. (Is that a word?) Over the years, I have tried numerous hand lotions and found this one to be my absolute favorite. My friend who is a nurse at Sloan Kettering Cancer Center recommended it to me about 10 years ago and I have been using it ever since. You only need to put on a little bit and it will keep your hands soft and moist for hours. It is a little thick, but once it’s rubbed in, it seems to form a protective layer. I always have one tube in my purse and another on my nightstand. If you do have dry hands or feet, try putting this on before you go to bed and your hands will wake up nice and soft the next day. You’ll pay about $4.50 a tube, but if you belong to BJs, you can buy the 4 pack and it works out to a little over $2.00 a tube. That is a huge bargain! So go bundle up with your scarves and gloves and boots and get to a drug store and try this lotion. Your hands will thank you! My cousin introduced me to Pinterest about three months ago. I kept hearing people talking about how great it was for sharing all kinds of ideas. If you are not familiar with it, it is “an online pin board” where you basically browse a category and when you find something you like, you “pin” it to a board and then you’ll have it for later to do or make or see. For example, if you see a recipe for chocolate chip cookies, you can pin it to a board called, “Desserts” and when you want to make it, you pull it up and voila! There’s the recipe for you to follow. I absolutely LOVE IT. Introducing me to Pinterest, however, proved to be a bit of a mistake for me. Ever since, I have been addicted to all the “Pinteresting” things that people do, make, say and want to achieve. Once I started with Pinterest, I was obsessed. The food, drinks, crafts, pictures of places I’d like to visit, fashion ideas, make up tips, shoes…I was in heaven!! What great ideas!! I can do that! I can make that! I can look like that! 1. Do you wake up in the morning and think about Pinterest? 2. Do you feel the need to go on Pinterest every day? 3. Do your thoughts and actions revolve around Pinterest? 4. Have people started to associate you with Pinterest? 5. Do you spend more than 30 minutes a day on Pinterest? 6. Can you go one day without checking Pinterest? 1. I will go on Pinterest every other day for no more than 30 minutes. 2. I will only pin things I will actually make, do, see, etc. 3. Since my food boards contain the most pins, I will use them. I will make a minimum of one new dish a week and not just let the pictures sit on the boards looking pretty. And yummy. To those who also follow The Cooking Goose, I apologize for this post. It is a repeat of what I posted on The Cooking Goose for the past two days, but I just had to share these two creations with The Squawking Goose followers. We ate the corn casserole with dinner tonight…AGAIN. With salmon this time. I cannot tell you how much I love the cake-y texture this has. And, I used non-fat Greek yogurt instead of low-fat sour cream. It had a slightly different taste, but still really good and EASY! And the cauliflower soup? We both had that for lunch. I had the lighter version with no milk and my husband had the creamier one. Cauliflower is in season now. You can usually find it for $2.50 or less, so give it a try and let me know what you think!